Check out the covers on these books. The pictures are from a calendar full of Japanese scenery, and so pretty! The pictures were sent to me by Jay, of Loopy4Ewe, an Etsy friend. Are those "stepping stumps" on the first one?! Jay saved the pictures for me, thinking that I could put them to good use so here they are! Two of them, anyway, I still have more to work with. Thanks Jay! 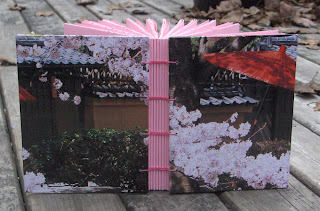 Jay is participating in the Weekend to End Breast Cancer event, so I am giving this book with the red umbrella and cherry blossoms, to her fund raising efforts. 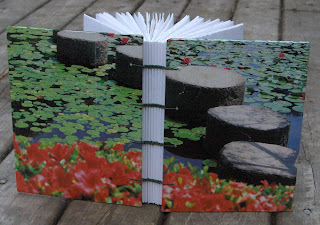 I have the book for sale in my Etsy shop and will make a donation when it sells.